An evening of beautifully crafted folk music, magical writing and spoken word linking local history and far flung words. 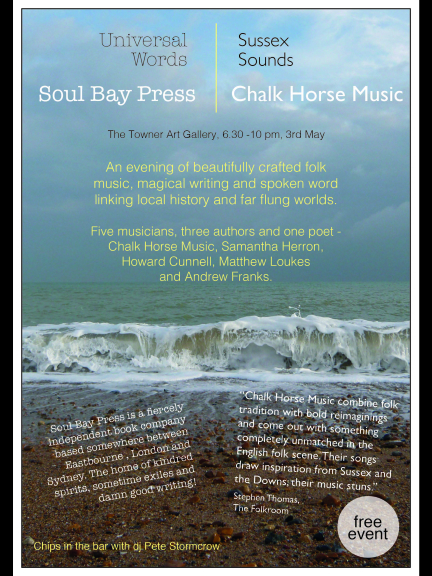 Five musicians, three authors and one poet - Chalk Horse Music, Samantha Herron, Howard Cunnell, Matthew Loukes and Andrew Franks. Soul Bay Press is a fiercely independent book company based somewhere between Eastbourne, London and Sydney. The home of kindred spirits, sometime exiles and damn good writing. Chalk Horse Music write songs inspired by the folklore, landscape and legend of Sussex. These are combined with their own arrangements of traditional repertoire with a Sussex history.